One of the groups slated for Drum Corps International's inaugural DrumLine Battle?„? demonstrations is Madah Bahana University of Indonesia. Madah Bahana members, who come from Depok, Indonesia, are no strangers to throwing down percussive beats in competition. 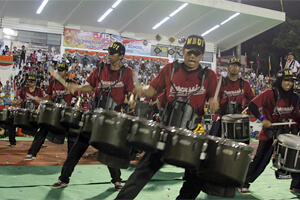 The marching band's drum line has already appeared in numerous Indonesian events similar to the new DrumLine Battle concept since 2007. This week, the group has submitted a special introductory video to say hello to the world and to share their enthusiasm for the new DrumLine Battle program. Check out Madah Bahana on Facebook.